Primarily because of the Red Tide; the Florida Fish and Wildlife Conservation Commission (FWC) has passed an executive order Executive Order: EO 18-45 temporarily making snook and redfish catch-and-release only from the northernmost point of Anna Maria Island in Manatee County to Gordon Pass in Collier County. This order took effect at 12:00 a.m. on September 28, 2018, and shall expire at 11:59 p.m. on May l 0, 2019, unless rescinded or extended by a subsequent order. In late September we entered, our fall fishing season and should have begun noticing cooler temperatures and less humidity, but not this year. Regardless it did not keep the fish from biting and made for some good mid-bay and North Bay fishing. As evidenced by Captain Mike Gore putting one back. Hopefully, the red tide issue continues resolving itself and we get back to our great October/November fishing, what this means is the bite should continue to improve as water temperatures begin cooling. What it also means is that November should be an excellent time to escape the chill of the north or the heat of our Florida summers and schedule a fishing trip. Having fished the Tampa West Coast waters for over fifty years, Capt. 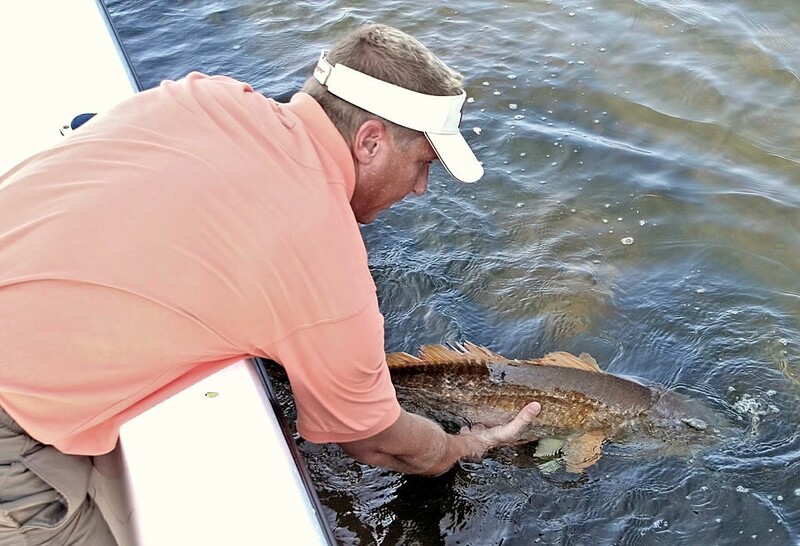 Woody offers a professional full-time guided charter fishing service. As the days become less humid and grow more pleasurable you will be able to experience some of the best fishing in the “Capital of the World”…Florida West Coast. Snook season is closed but still, catch and release. Greenbacks are still the bait of choice. We have also been catching them on fresh cut bait lying on the bottom. Anglers using live bait should have no problem finding plenty of greenbacks, threadfins, or pinfish. It’s not uncommon for a juvenile snook to chase down a greenback, but the larger fish are usually neutral in pursuing a fast swimming greenback. Instead, they seem content to take damaged or dead bait off the bottom. A simple technique I have been using to slow down my live bait is to break its back or cut off the tail fins. Carl thought it was a giant snook but turned out to be a huge Yellow Tail Jack. Man those guys can fight. 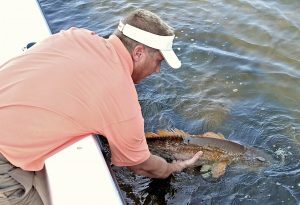 Redfish are also closed, but still catch and release and seem to be on every grass flat and also eating live and dead baits. We are catching plenty of nice size fish. the broken bottom grass flats, submerged oyster bars and mangrove shorelines throughout the mid and upper Tampa Bay seem to be holding hungry redfish. Greenbacks, dollar size pinfish, big shrimp, or fresh cut bait along with some good old-fashioned fishing patience seems to do the trick. Spotted Sea Trout actions on the upswing with good reports when fishing strong tide days around deeper grass flats. They are eating freelined shrimp and under a popping cork and freelined greenbacks. Deeper flats, good moving water in or out prove deadly in catching nice Trout. Artificial Lures: If you are interested in something different, perhaps it is time to try artificial lures. Fall and winter are great times to use them. They give fish a look at something totally different, like color, shape, and action or a combination of all might entice them to strike. Some lures float, some dive, while others suspend, but all usually require a learning curve, but remember that’s half the fun. Fishing artificial’s requires a certain level of talent, but once you start you will surely enjoy mastering the techniques. If you’re an artificial lure angler topwater lures do well on early morning grass flats. My topwater lures include MirrOLure Top Dogs, or Catch 2000 and are loads of fun especially the unanticipated strike when the explosion from beneath almost stops your heart. Cobia can show up on the back of large Rays and Manatees. Check buoys and markers and keep an eye out when Mackerel fishing especially if you’re using a chum bag. Have a slightly heavier rig ready because they tend to pop up at the most inopportune times, like when you are not ready. Many times, we have been fishing for mackerel and looked behind the boat to see one or two cobia hanging around the outboard. Mackerel action should remain strong, look for diving birds and you have probably found a school of mackerel, jacks, or ladyfish; also look for schools of threadfins or glass minnows and you will usually find the same thing. Try using 40# to 50# Seaguar Fluorocarbon Leader with long shank #2 or #3 Daiichi hooks. Free line the baits in the current with a #3 split-shot weight. Mangrove Snapper has flooded Tampa Bay grass flats, bridges, markers, and docks. Try fishing with small greenies and shrimp as they should produce some nice sized fish often tipping the scales around 1 to 3 pounds. Lighter Seaguar fluorocarbon leader, small slip sinker, a # 1 hook and you’re in business. Captain Woody Gore’s Guide Service is the area’s top outdoor fishing guide service. He’s guided and fished the Tampa, Clearwater, St. Petersburg, Tarpon Springs, Bradenton, and Sarasota areas for over fifty years and offers world class fishing adventures and a lifetime of memories. Single or Multi-boat Group Charters are all the same. With years of organizational experience and access to the areas most experienced captains, I can arrange and coordinate any outing or tournament. With access to a fully staffed guide service we can accommodate any size Group or Tournament; just tell me what you need and it’s done. Visit the Website WWW.CAPTAINWOODYGORE.COM, Email fishing@captainwoodygore.com or Give Him a Call & Go Fishing Cellular/Text: 813-477-3814.